A Florida man who fatally shot his sleeping wife and then raped and killed his young stepdaughter 22 years ago was put to death Thursday for the child's slaying. 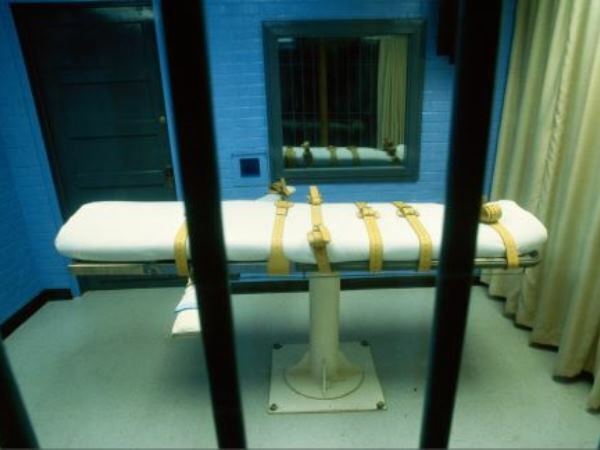 Chadwick Banks (43) was pronounced dead at 7:27 p.m. EST Thursday after a lethal injection at Florida State Prison, the office of Gov. Rick Scott said. Banks was condemned for the 1992 killing of 10-year-old Melody Cooper. Banks also received a life sentence for the murder of his wife, Cassandra Banks, in the attack in Florida. Banks wore the white skullcap of the Muslim Brotherhood before the lethal drugs were administered, looking directly at the family of the victims when he delivered his final statement. "I'm very sorry for the hurt and pain I have caused you all of these years," Banks said. "Year after year I have tried to come up with a reasonable answer for my actions. But how could such acts be reasonable?" Authorities said Banks was drinking and playing pool at a bar before going home around 3 a.m. the night of the slayings. Banks shot his wife point-blank in the head and then raped and shot his stepdaughter, according to authorities. Banks, who was 21 at the time of the killings, received a life sentence for his wife's murder, and a jury recommended the death penalty for the stepdaughter's slaying. The mother and grandmother of the two victims, Annette Black, said after the execution that she appreciated Banks' apology and said she hoped his case would serve as a lesson to people before they make bad decisions while using alcohol or drugs. The execution was the eighth in Florida this year and the 20th since Gov. Rick Scott took office in 2011. That's one fewer than under Gov. Jeb Bush during both of his terms. Bush presided over the most executions since capital punishment was reinstated in the state in 1979, but Scott was just re-elected to a second term. Banks ordered a last meal of fried fish, French fries, hush puppies, banana pudding and ice cream, said spokeswoman Jessica Cary with the Florida Department of Corrections. Fourteen family members visited him and he spent time with a spiritual adviser. Florida uses a three-drug mixture to execute prisoners: midazolam hydrochloride, vecuronium bromide and potassium chloride. The drugs are administered intravenously and are intended to first induce unconsciousness, then paralysis and finally cardiac arrest.